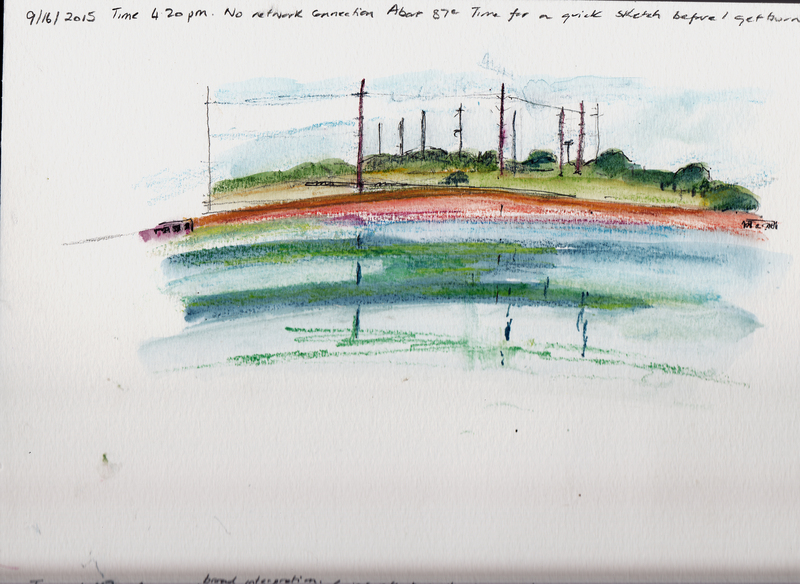 Notes:9/16/2015 time 4.20pm No network connection About 87c Time for a quick sketch before I get burnt. My usual inertia hid me after my morning training run and before I knew it I had wasted a complete day. So I decided that despite the heat and humidity, I would go to Pflugerville Lake when I went shopping. I actually did my shopping before I drew as I popped into Walmart to get a new acto knife as I hadn’t put my normal one back into the bag. There is no shade at the Lake and very few benches so I ended up on a fishing pier. I had brought along my watercolour pad but didn’t feel comfortable balancing a palette on the top of the pier fencing. So I used my aqua pencils but began by doing a light drawing in pencil and I ended up using a fine tipped pen to finish with a few details. It was weird experience drawing on the pier which is over the water. After about 10 mins, I was feeling a bit dizzy. At first I thought it was the heat as it was very hot with the sun reflecting off the water (I had sweat dripping down my face). Then it dawned on me, it was actually the effect of the water motion at the corner of my eyes. I was actually feeling a bit seasick! I wish I had remembered my hat as it was very difficult to make out the scene due to the strong light from the water and sky. In the end I decided it was best in the short time I had available (I had groceries in a hot car ) just to aim for a quick impression. Overall I was OK with the result. In an effort to get rid of my dislike of watercolour, I have signed up for a boot camp at the local art school, The Comptemporary Austin Art School. I looked up the instructor and although her work is not really to my taste, she looks very proficient in watercolours. With the coming cooler weather (please October be cool), I am hoping to become more adept in watercolours. Finally, as I opened the box of aqua pencils, guess what I saw? That’s right the elusive acto knife. Now I have 2 in my bad so no more blunt pencils! You’ve captured the movement of the water really well and the vehicle adds scale to the scene. Well done for combating the seasickness.